Taj Connemara, Chennai is one of the city's true heritage hotel. Initially sporting the Art Deco look when it opened in 1937, today the hotel is still infused with its original colonial style and features from the famous Geoffrey Bawas tropical modernism style. 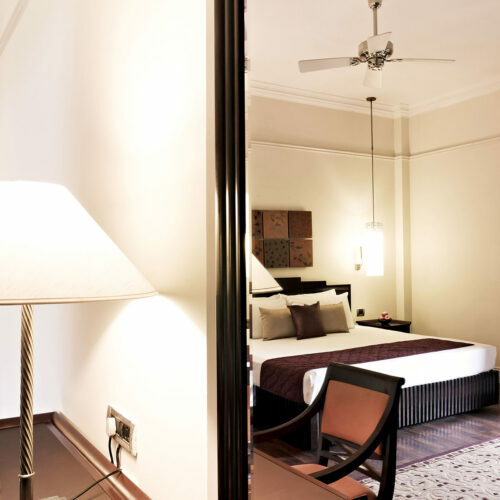 Having been managed by the Taj hotels since the early 1980’s and having gone under an extensive year long refurbishment, the hotel is looking better than ever. Enter the grand lobby and step back in time. Brass statues, elaborate staircases, lattice work, marble floors and south Indian stonework throughout the hotel pays homage to the rich design culture of Chennai. There are 140 light and airy rooms are some of the largest and most spacious in the city, all complete with the latest modern day comforts of home including four poster beds, objects d’art and vintage textiles. The hotel has two main restaurants – Raintree, which highlights the unique and rich cuisine of the Chettinads with its rich meaty dishes and fiery spices set in a pretty al fresco setting. whilst Italian and South Indian cuisine is offered at warm and welcoming all day Verandah restaurant. The Lady Connemara Bar & Lounge was the first licensed bar in the city and holds an impressive cocktail menu. The signature Jiva Spa offers a wide range of therapies ranging from local ancient beauty rituals to healing Ayurvedic massages. Both complementary daily and personalised yoga sessions are available. 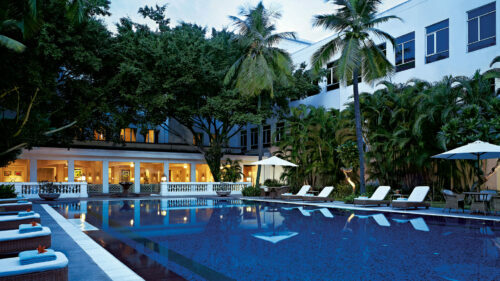 The inviting pool is set out in the courtyard surrounding by lush gardens. Located just is 1.5 miles from Marina Beach and 45-minutes from the Chennai airport this is a great city hotel, which combines colonial charm with modern conveniences. Recently declared as a Creative City by UNESCO, there has never been a better time to discover this gentle south Indian city with its rich history and welcoming culture.